Wonderful hotel - with wonderful pool - spotlessly clean. Room was large - bed and pillows comfy, clean, lovely balcony. Staff were warm, hospitable and very helpful. Plenty of on site parking. Really enjoyed our stay there. The service was incredible! A storm hit while we were there and we had to stay on the island for 2 more days. The staff went over and above to ensure a smooth transition to our new room! They offered free transfers to the port and the closest beach after breakfast! Truly a wonderful experience!! I highly recommend this hotel. The best breakfast we had during our stay in Greece everything was so delicious IN LOVE WITH THE BREAKFAST! Also the hotel is very nice and the rooms are comfortable. The staff is beyond nice, we bought ferry tickets online and we were able to get printing service at the reception with no cost they really care for their guest. We also got transportation from the hotel to the ferry station at no extra cost. LOVE THIS PLACE and definitely recommend it! The staff at front desk and also in the restaurant were exceptional and friendly. George and Rania waited late in the night to check us in and helped with everything most of the time with broad smiles and gave friendly advice. They also arranged some extra veg food in breakfast. The rooms were clean and the decor white and nice. Lot of pillows (too many actually) though limited space to stow them when not needed. Kitchen and utensils and crockery plentiful. The swimming pool was also quite good. Very nice and clean hotel, the staff and managers were great doing there best for the guests. Good and rich breakfast.Its a 3 star hotel but offers 4 star services and conditions. The staff is very warm, diligent and attentive. They made sure everything was perfect during our stay. Breakfast was delicious and complete. Just right for the hot temperatures and with local products. The hotel has beautiful gardens with an impressive array of colorful flowers. The whole place was sparkling clean. The location is very convenient, there is a free shuttle running from/to the port, city center and airport (which is 8 minutes away by car) The restaurant serves delicious homemade food. Room was well equipped and comfortable. On my way back to Athens, we had to stay overnight in the island and chose this hotel again. I really recommend it. Note that the place was not full during my stay(s), as I went just before July. the free breakfast, the personnal and the swimming pool. We booked a standard room but when we got there they offered to show us upgraded rooms which I would strongly advise to upgrade from basic rooms. The staff were friendly and it was surrounded by beautiful scenery and views. Lock in a great price for Golden Sun Hotel – rated 8.9 by recent guests! Golden Sun Hotel This rating is a reflection of how the property compares to the industry standard when it comes to price, facilities and services available. It's based on a self-evaluation by the property. Use this rating to help choose your stay! 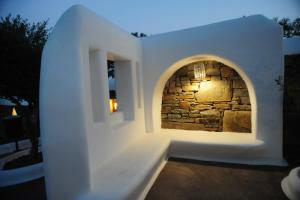 Golden Sun Hotel is in a quite setting in Agios Prokopios beach, only 2 miles from Naxos Town. It features a swimming pool, a children’s pool and a hot tub. The 3-star complex consists of 5 buildings and offers fully furnished and spacious rooms. Each air-conditioned room is tastefully decorated and is has a refrigerator. Wi-Fi internet access is available at the front desk and the pool area. Private parking is also available. Agios Prokopios Beach has fine sand and crystal clear waters. The area makes for an excellent resort with frequent services to Naxos Town and Agia Anna. When would you like to stay at Golden Sun Hotel? Opening to a balcony with magnificent views, this air-conditioned studio features a well-equipped kitchenette. It also comes with a refrigerator and satellite TV. The bathroom is stocked with a shower, while free toiletries are offered. 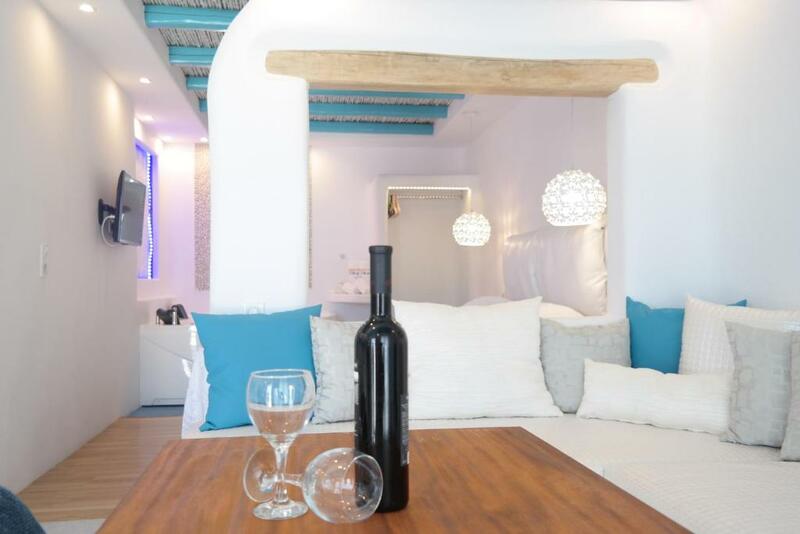 Enjoying Aegean Sea sea views, this spacious suite combines traditional Cycladic decoration with modern touches. It features a seating area and separate bedroom with Coco-Mat mattresses. Its elegant bathroom comes with a rain shower, while branded toiletries are also offered. A well-equipped kitchenette is also included. Please note that the sofa bed is for 2 people. Kindly note that the units include either a shower with hydromassage facilities or a bathtub. Located on the upper floor, this junior suite successfully combines modern and traditional Cycladic decor. Fitted with Coco-Mat beds and unique decorative items, it opens to a terrace overlooking the Aegean Sea. Facilities include free WiFi access, plasma satellite TV, safe, top-quality toiletries and kettle. Featuring a terrace with garden views, this elegantly decorated family suite includes a separate bedroom with en-suite shower, a well-equipped kitchenette, and an additional bathroom with hydromassage shower. It is fitted with Coco-Mat beds and also features free WiFi access, plasma satellite TV, safe, top-quality toiletries and kettle. House Rules Golden Sun Hotel takes special requests – add in the next step! Golden Sun Hotel accepts these cards and reserves the right to temporarily hold an amount prior to arrival. The fact that you would have to pay 10 euro to use one of their pool towels - you can however bring your own for free. The room had nothing to do, with what was saying at Booking.com and the mattresses were unacceptable. Never again. The rooms lack cabinets and places to keep clothes and shoes and so on. The family rooms are just about enough size for 4 people. There was not much food on offer outside of the breakfast. Some snacks would be nice so that people do not have to always go outside to eat all meals. They were willing to take us where wanted to go.